A couple of weeks ago we were pleased to celebrate our 20th anniversary. It's truly amazing: 20 Years of Remote Sensing! Since 1998 we’ve been exploring the world of remote sensing. From satellite technology and image processing to information platforms and Earth observation services. Remote sensing technology is no longer the goal, but a powerful tool in our search for true information about our environment, society and economy. Space is currently experiencing an innovation-driven paradigm shift, both from within and outside of space domain. Space used to be a domain for science and public authorities, but with industry finding its way towards the data and technology available we’re moving full speed ahead towards an economy based on space assets and technology. Just think about connected world, IoT, cloud access, artificial intelligence, deep learning, etc. These technologies are evolving at lightning speed giving us the capacity to process, analyze and share huge amounts of data and information derived from space infrastructure. Thanks to technological improvements and cost optimization, Remote Sensing is now more than ever available for commercial players. For instance, the Belgian potato sector is now actively using Remote Sensing technologies to increase yields in a sustainable way. By combining large scale objective Remote Sensing data through the watchitgrow platform and combining it with various other data sources, it will be possible to provide better insights to farmers and save on chemicals while at the same time increasing yields. To boost the uptake of Earth Observation technology the European Commission set up the Copernicus program. Already seven Sentinel satellites in orbit give us more than 25 terabyte of open and free data every day to help address today’s global challenges such as urbanization, food security, natural disasters and, of course, climate change. But the true value lies in analyzing, combining and integrating this data in broader information systems. It’s the multi-disciplinary approach that is crucial for companies eager to grow in a circular-based economy. During our anniversary event, keynote speaker Peter Hinssen also emphasized the importance of platforms. Platforms are the new 21st century reality. Just think about going one day without your smartphone. That one little device that offers you a bunch of information to assist you in making decisions throughout the entire day. According to the Organisaton for Economic Co-operation and Development (OECD) everything will be a service by 2030. Industries are making a transition from a product-based economy to a service-based economy. You can for example sell a “plant that grows” instead of a seed where the risk on economical return is fully at the individual farmer. Remote Sensing offers monitoring capabilities as never before, it is this continued objective & digital measurement of things that enables shifts towards a service-based economy. Companies are moving away from traditional business model of linear economy and profit only thinking to a more sustainable business model which considers their economic, social and environmental responsibility. Bio-economy relates to the sustainable production of biomass (plants, trees, algae, organic waste…) and its transformation into a range of products for human food, animal feed, chemistry, materials and energy production. With our growing population, global agricultural production is under pressure. We need to evolve to sustainable agriculture, to know how, when and where to act to produce more while safeguarding our planet. Agriculture needs to leapfrog into its future and urgently start to make efficient and effective use of latest digital technologies. Looking back at the productivity increase that has happened by digitizing other domains, one can expect at least 10 – 15% productivity increase just by digitizing. 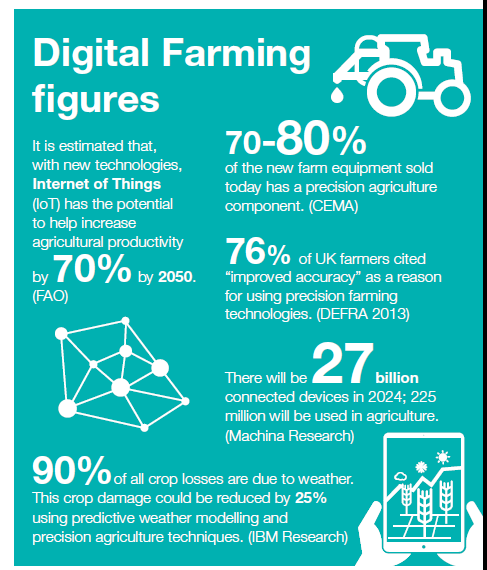 Remote Sensing enables farming to be smart, digital and sustainable. Use the objective and digital data with the latest state of the art techniques such as Artificial Intelligence & Deep Learning to make the necessary analyses, extract the info you truly need and ‘translate’ the real world into a digital one, creating a digital twin. Only this process will give us true advice and actions to work and grow with. As we all heard before, it’s the day after tomorrow we should think about. Although it’s hard to find time when solving the SOY (shift of yesterday) as Peter nicely said, we need to keep up the pace and challenge ourselves to make every effort needed to tackle major global concerns. We believe it’s crucial to connect different domains and use a multi-disciplinary approach that will assist us during decision-making processes to achieve our goals. Airborne & spaceborne remote sensing is only one technology delivering data. Novel techniques in Remote sensing like hyperspectral sensors, CubeSats platforms, artificial intelligence, etc. are popping up but have not yet reached a full operational state. Thanks to long term participation of VITO Remote Sensing in the SPOT-VEGETATION initiative, VITO Remote Sensing is a key player in global agricultural monitoring already. With the technical evolution Remote Sensing is going through, new markets can now be explored and we’re ready to push the limits. The level of detail is now down to field level or better hereby bringing relevant information to commercial organizations around the globe. So as Arthur C. Clarke beautifully said “The only way of finding the limits of the possible is by going beyond them into the impossible.” Let’s keep that in mind for the new year to come and get ready for another exciting year.